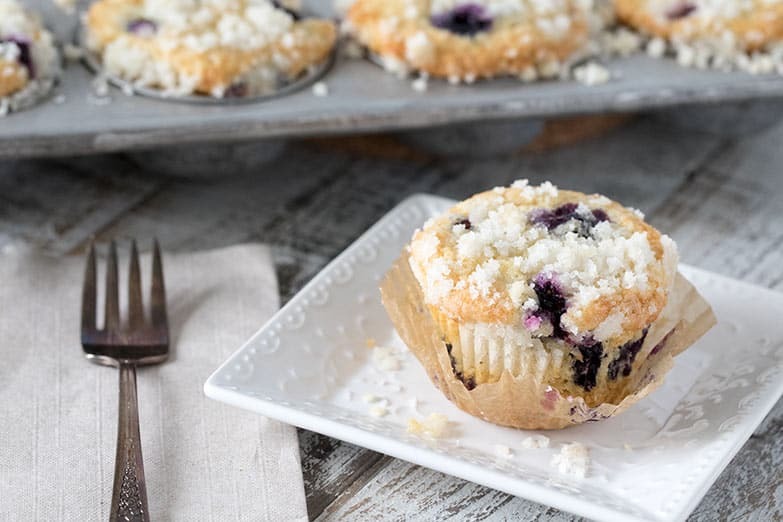 I’ve made these twice, and they are by far my favorite homemade blueberry muffin! My question is about the topping. Mine has not stayed as a sandy streussel, but has cooked into a layer of crisp sugar. What type of oil do you use? I’ve used Canola since it’s what I had; could that be the problem? Hi, I was wondering if I could use dried blueberries for this recipe? It much easier to get and much cheaper where I live. And is I can, do I need to soak them in something? Hi Rita – Sure, dried blueberries would work fine. I often add dried cranberries and I generally add dried fruits without soaking them. Enjoy! 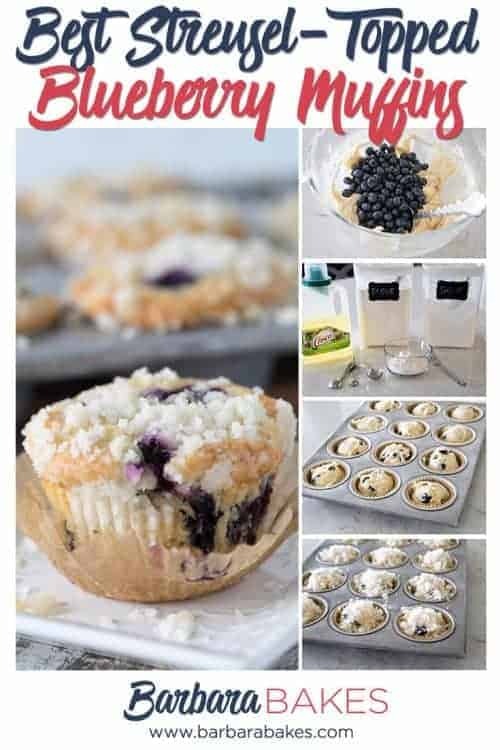 I have tried many, many, many blueberry muffin recipes, but this one is by far the best. I did, however modify it a tad. I use usually only 1/2 the amount of blueberries called for since i prefer i better cake to fruit ratio and I omit the streusel topping. Those muffins freeze extremely well and are still to-die-for, when defrosted. Today, I subbed canned tart cherries in place of the blueberries,. I bet that they are just as delicious. Thank you and your friend and the chef to share this with us. I just found the blueberry muffin recipe and wondered if I use frozen blueberries should I thaw and drain them? Hi Sue – I prefer to use them frozen because the thawed berries discolor the batter more. You will have to increase the cook time a little when using frozen berries. Thanks Carolyn for taking the time to let me know you enjoyed them! Just made these. They look and are delicious! 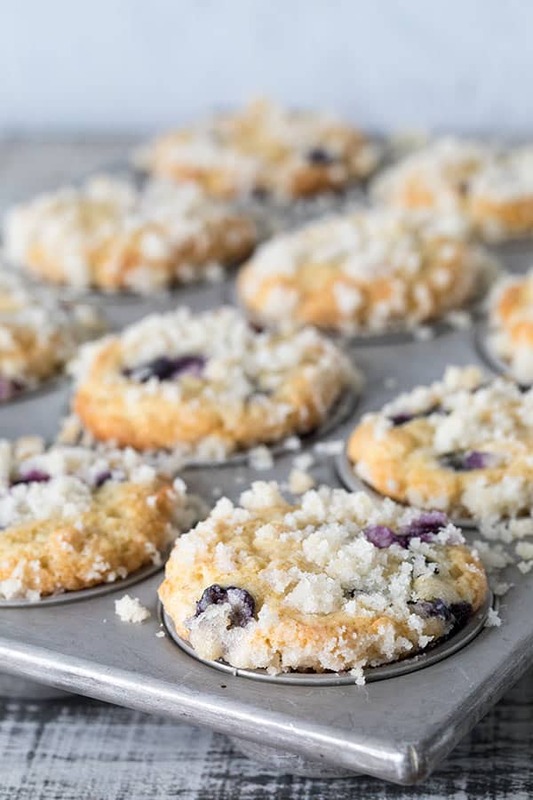 What’s the best way to store these muffins? Thanks Isabel! They’re best if you pop them in the freezer and just pull them out to eat a few hours before you want to enjoy them, or zap them for a 30 seconds in the microwave. Thanks for the quick reply. That’s what I will do for the next batch. I don’t think this batch will see the freezer!! Thanks so much Felicia! Glad you loved them as much as we do. The recipe worked well. I replaced the 1/2 cup of whole milk with 1/2 cup Greek Yogurt. Also, I baked in an 8×8 square pan, which resulted in 8 rectangle servings. The bread/cake was tender with just the right amount of sweetness. Hreat recipe! Thanks Jodie – sounds like fun changes. What if I wanted to turn this into a loaf instead of muffins? What would I need to change? Delicious! Thanks for sharing! Made for my family 🙂 asked for more when they were gone. Thanks! They’re always a hit at our house too. I´m gonna bake them tommorow since my grandma is celebrating her birthday tomorrow. They look so delicious! You mean 350°F right? Because I´m from Germany and we use ° Celsius and I just wanted to be sure about that haha. Hi Damaris – yes, 350°F. Enjoy! Made with these muffins with my sweet 3 year old daughter 🙂 she loved helping and especially sampling the sugar 🙂 thanks for sharing! Thanks Hehley – sounds like a fun way to spend time with your sweet little one. Hi Barbara! 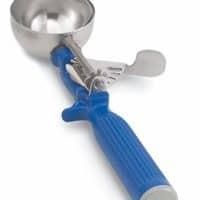 I’m from Italy and I really would like to try your recipe… Could you tell me how to turn cup in grams? Or do you have a recipe with ingredients in grams? Thank you very much! 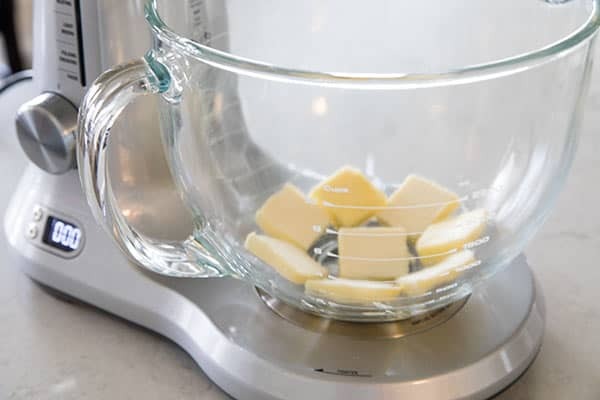 Hi Vittoria – I don’t have a recipe with ingredients in grams, but here’s a great chart that can help http://www.kingarthurflour.com/recipe/master-weight-chart.html Enjoy! I am doing a trial run tonight on these muffins.i am at 3000ft elevation and I don’t think I will need to make any adjustments. However, if anyone has some suggestions I’m all ears. Thank you. Hi Kaylin – I live at about 3500 ft. so you won’t need to make any changes. Just made these – delicious! 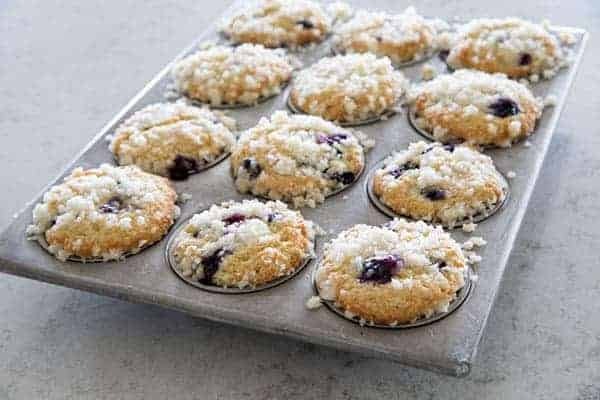 You note the blueberries don’t sink to the bottom because of the thick batter but in the pic it looks as if you’ve used the “lightly tossing in flour” method for the blueberries which is a helpful hint to prevent fruit from sinking to the bottom. Hi Barbara – so glad you enjoyed them. When I made them, I did toss them in flour, but I don’t really think it’s necessary in this recipe and don’t usually do it when I make them – and I make them often. However, if you prefer to do it, that’s great too. Positive feedback is always appreciated and I am here to tell you that this recipe is absolutely wonderful!! Normally my muffins always have a dry and mealy texture to them….these guys are soft, moist and insanely delicious. First batch yielded 14, second batch 12. First batch I did to the letter and were amazing!! They didn’t last 24 hours as my family couldn’t keep their hands off them!! Second batch I just added a touch of cinnamon to the streusel topping and then a touch of sugar in the raw straight on top for a bit of crunch! LOOKING FOR A GREAT RECIPE BARBARA BAKES GOT IT!!! It’s a keeper!! Thanks Jennifer – your comment really brighten my morning. So glad you loved them. Sounds like great additions. 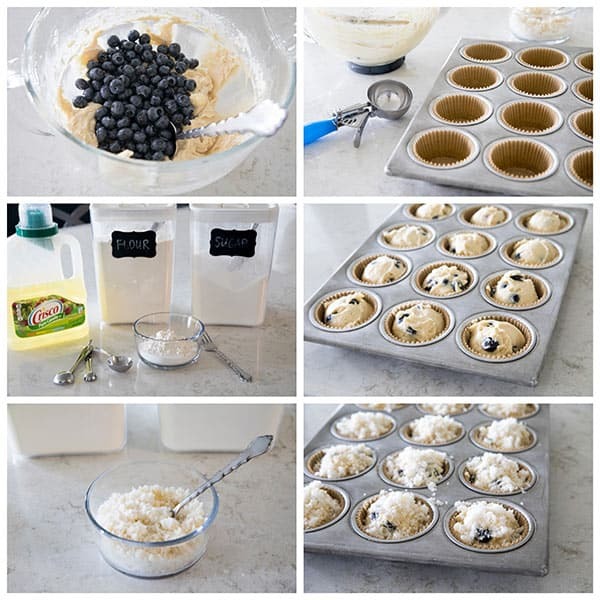 Went blueberry picking yesterday and wanted to make muffins and while looking for a recipe I found yours. I gave it a try and it was so easy to make and awesome tasting. This one will be the recipe for me! How fun to pick your own blueberries for the muffins. Thanks so much for letting me know how much you liked the muffins! Yup, me again. 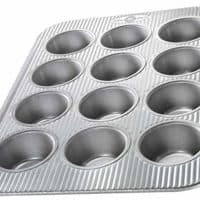 I just bit into my first muffin using this recipe… HEAVEN. I picked up blueberries at the farmers market this weekend, can’t believe I made it two whole days without making these. Never again… these will be first priority from now on! Whew they are good!! Thank you so much for sharing this recipe! Now I’m going to spend at least an hour clicking around the rest of your blog! 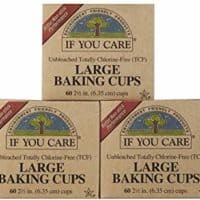 I can’t wait to try these muffins! I made a peach crisp yesterday and misjudged the size so I have a bunch of extra Streusel-ey topping leftover that is just crying for a blueberry muffin!